Jewish Home chairman says he will work to bring down the government if it works towards establishing a Palestinian state. Jewish Home chairman and Education Minister Naftali Bennett on Thursday made clear that he will not allow a Palestinian state to be established. The comments came in response to this week's statement by Prime Minister Binyamin Netanyahu and Defense Minister Avigdor Liberman in which they expressed support for peace talks with the Palestinian Authority (PA) and for the “two-state solution”. 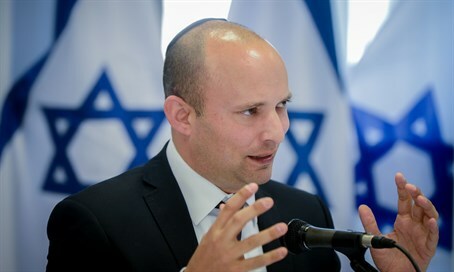 “We are the only party and I am the only leader in Israel who says ‘no Palestinian state will be established here,’” Bennett told Channel 2 News and stressed that Netanyahu and Liberman are wrong in their statement. Bennett added that following the insistence of the Jewish Home party, there was no mention of a Palestinian state in the guidelines of the current government. “We should not accept the Arab initiative and not start a diplomatic process [with the PA],” he said. “As long as we are around, there will not be a Palestinian state on Highway 6 and we will not divide Jerusalem. I do not accept such a thing. We will stand firm against historical errors, and if there will be talk about dividing Jerusalem and a return to the pre-1967 borders, I will not only quit the government, I will also bring it down,” stressed Bennett. Bennett’s comments follow Justice Minister Ayelet Shaked’s remarks against Netanyahu and Liberman's statement earlier in the week. Speaking during a tour of Samaria's Binyamin Region Shaked vowed her party would never allow the surrender of Judea and Samaria for the creation of a 23rd Arab state. "To state the obvious: As long as we are in the government, a Palestinian state will not be established, settlements will not be evacuated and no territory whatsoever will be surrendered to the enemy," she declared. "Today it is clearer than ever," she continued. "The Jewish Home is the only party which fights for settling the land and against the establishment of a Hamastan or an ISIStan next door to us." Meanwhile, the UN's special coordinator for the Middle East peace process Nickolay Mladenov accused Jewish Home of "killing hope" for a peace treaty with the Palestinian Authority. "The determination of some ministers in Israel to block progress and kill hope by promoting illegal settlements and rejecting a Palestinian state is concerning," he said. Mladenov said Shaked’s comments were particularly concerning as they came "a day after encouraging signs by the Prime Minister".